Located just above Park City Mountain Resort’s Canyons Village, Doc’s Run overlooks the village area and Swaner Preserve and Ecocenter’s open space. On a bluebird day, you can even see as far as the Uinta Mountain Range. Doc’s Run offers a steady pitch, allowing you to coast into Canyons Village with ease. It’s a great way to finish up a day on the mountain, as it is accessible via the Orange Bubble Express lift mid-station, which drops you off right next to Lookout Cabin where the fondue and views from the deck will knock your socks off. The view from midway down Doc&apos;s Run at Park City Mountain Resort. Accessible via Park City Mountain Resort’s McConkey’s lift, the Georgeanna run provides expansive views of Mt. Timpanogos, 10,420 Peak above Guardsman Pass, Heber Valley, and, in the other direction, the town of Park City and the Uinta Mountain Range. You’ll also be able to see Jupiter Peak to the right from the top of the lift. At the top of McConkey’s lift, take a left and continue straight. Georgeanna runs along the edge of the resort property line, situating it directly next to Deer Valley Resort and its Lady Morgan chairlift. Once you reach a Y intersection, the trail continues around to the left. If you’re up for more of a challenge, stay straight and take Tycoon to the bottom. 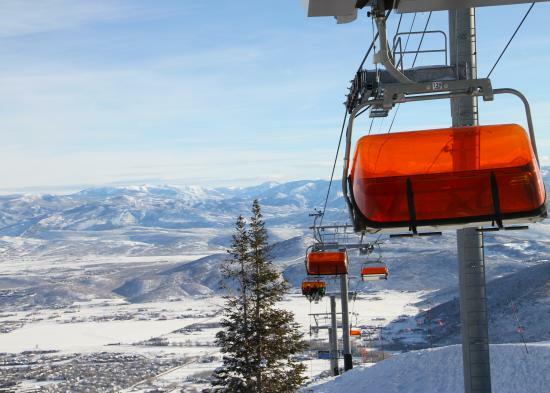 Expansive views from the top of Park City Mountain Resort&apos;s McConkey&apos;s lift. 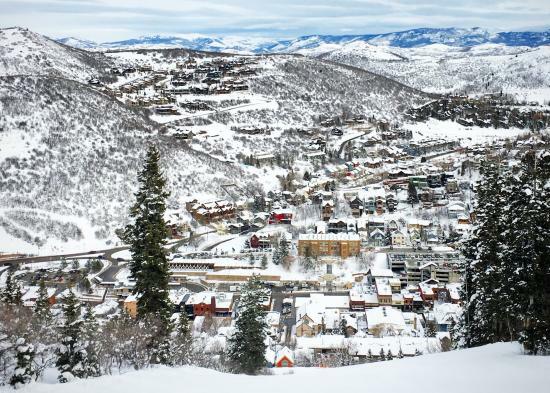 Providing skiers and boarders with access to Park City’s Old Town district, Quit’N Time is a great ski run to explore around lunch time or at the end of your day for après-ski. Located at Park City Mountain Resort, Quit’N Time offers a unique view of town’s historic charm and colorful buildings, as well as the Uinta Mountain Range in the distance. Even if you’re not going to explore town, it’s a fun trail to try, and it’s easy to hop on Town Lift and return to Park City Mountain Resort’s other terrain from the bottom. Quit’N Time is located just off the PayDay ski run, and can be accessed via the PayDay lift or Town Lift. Not only is it a fun intermediate run, Quit&apos;N Time offers a unique view of Historic Park City. 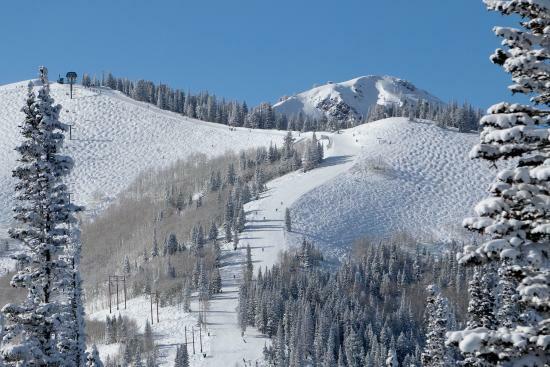 Homeward Bound starts atop Deer Valley Resort’s Bald Mountain, and can be accessed by Sterling Express, Wasatch Express, or Sultan Express lifts. Don’t be fooled by this trail’s beginner difficulty rating, the views are absolutely jaw-dropping. As the top of Homeward Bound starts turning, skiers are greeted with a panoramic view of Mt. Timpanogos, Heber Valley, Guardsman Pass, Clayton Peak in Big Cottonwood Canyon, and Empire Mountain at Deer Valley Resort. It’s the only trail on the mountain that offers this expansive view. 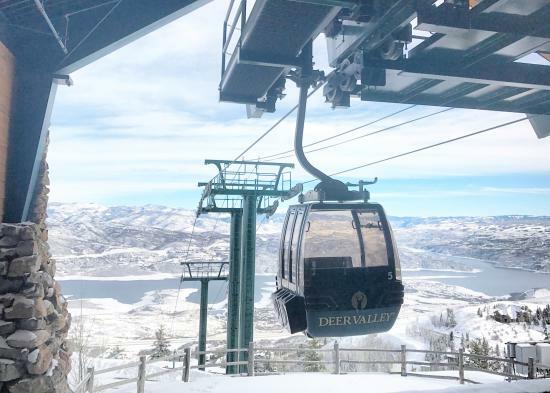 Homeward Bound at Deer Valley Resort is a ski run with unparalleled views. 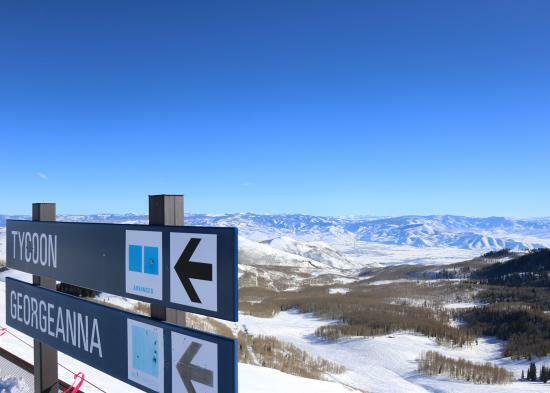 Deer Valley Resort’s Jordanelle ski run is not centrally located, but we highly recommend you explore this area because the views are breathtaking. This run offers expansive views of the Jordanelle Reservoir, and the Uinta Mountain Range as skiers meander along the trail past beautiful ski-in/ski-out Deer Crest homes. The views don’t end there! Soak up the beauty as you enjoy a sheltered ride back to the top of Little Baldy Peak aboard the Jordanelle Express Gondola. To get to Jordanelle ski run, you’ll first have to ride up Mountaineer Express. Accessible via the top of Deer Valley Resort’s Empire lift, Supreme ski run holds its name for a reason – its views are a cut above the rest! Take it all in from the top – you’ll be able to see Deer Valley Resort’s Silver Lake area, Empire Canyon, Montage Deer Valley, the Uinta Mountain Range, parts of the town of Park City, some of Park City Mountain Resort, and, in the other direction, some of the peaks atop Guardsman Pass (10,420 Peak included). In short – you can practically see it all! 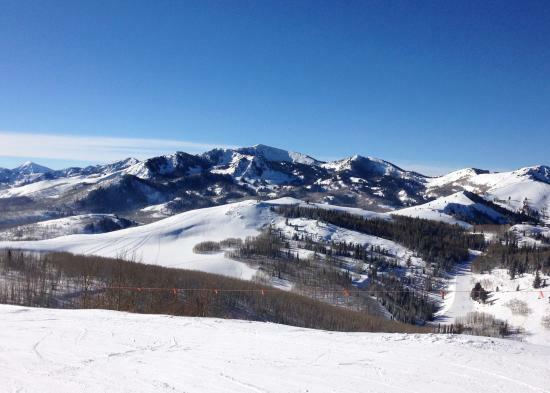 Empire Mountain is Deer Valley Resort’s tallest peak, and smooth and gentler pitch of Supreme allows for intermediate skiers to access the views and explore the terrain.